This post has been sitting in my drafts folder for a few months! Sorry to post it so late. Benny Baggott facilitated the Domino Game. In this game teams estimate how long it will take them to build a tower of Dominoes to a specific height. Once they start executing the facilitator starts to treat each team a little differently to see how outside influences affect their progress towards their goal. Each team had different outcomes and it was a very interesting conversation afterwards. It was noted that once one team finished and Benny started urging other teams to finish as fast as the first team they felt more pressure and knocked their half built towers down more. We discussed another option for running the game would be to have the different teams in separate rooms where they cannot see each other and then when getting estimates say things like "Really? That's your estimate? The other team was doing it in half that time." The idea is to illustrate how these outside influences from management can have a significant detrimental affect on team performance. 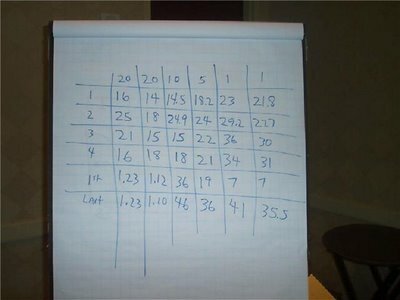 Tommy Norman ran the Penny Game which a few people has done before in their certified Scrum Master training. In this game you simulate work by having 4 people at a table flip 20 pennies and pass them around the table. You start with large batch sizes and then reduce the size from 20, 10, 5, and finally to 1. The time each person takes is timed by their "manager" and the "customer" times how long it takes for them to get their first deliverable while the "CEO" times the whole process start to finish. After repeating the process with the different batch sizes you get some interesting conclusions from the time data. Time to market and total duration of a project is greatly reduced with the smaller batch sizes, but the individual performance is longer. The cost of each batch transition (passing the pennies to the next person) which could equate to any hand off overhead in your process adds up and reduces the efficiency of each worker but the performance of the whole process is much better. It is also a great way to also debunk the myths of productivity by making the individual parts of a process more efficient rather than the whole process. This is another game some people had experienced as part of previous Agile training, but not as much as the penny game. Peter Balcarce led this game in which everyone is on a team who's goal is to pass around balls of various sizes to each other seeing how many they can get all the way through in 2 minutes. The rules are you have to have air time when passing the ball, everyone has to touch the ball at least once, you cannot pass to the people directly left or right of you, any dropped ball has to start over, and the first person who touches the ball has to be the last person. You get 1 minute planning and retros between 5 of the 2 minute sprints. Those who have done it before are asked not give away the better processes for passing around the balls and to let the team self organize to figure it out. Generally the first run is very hectic and the team does not meet their goal. They normally regroup during the 1 minute retro and improve their process. On the second or third run the facilitator will start to remove people to simulate team members being called away for other important work. They also will bring in new team members who may not know the rules. The effect is that removing or adding team members almost always causes a significant disturbance. Some other observations we had were that when we were tossing around balls of roughly the same size (like tennis balls) we established a good rhythm but when balls of drastically varying sizes were introduced we were not as efficient. This is a great game for managers to show them how shuffling teams has a detrimental effect on their performance. 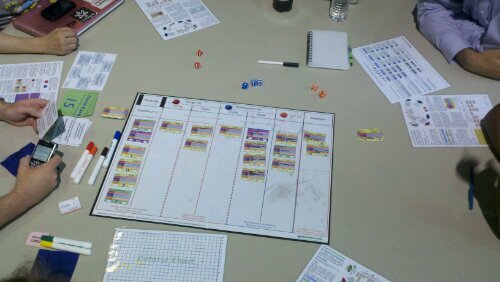 Chris Hefley and the gang from LeanKit Kanban introduced the GetKanban Board Game which is a fun, hands on way to learn the basics of Kanban. There are several versions of the game, some you can download for free, and everyone who played had a great time and said it really brought home the concepts of WIP, bottlenecks, lead time, etc. We'd like to thank all attendees and those who helped facilitate the games. We would also like to thank our sponsors: Holland Square Group, Vaco, LeanKit Kanban, and Omnicell. Is there an email I can contact you on? I'd like to speak to you and get your opinion on an agile PM tool based on Kanban that our team has recently developed. It would be thrilling to get your opinion on that, as we strive to make really lean and just what the actual users would need.